Woohoo! I’m officially past the half way point. I can’t believe I haven’t eaten added sugars in 15 days. That’s pretty crazy when you figure the average American eats 30-60 teaspoons of sugar a day. That’s 1/4 to 1/2 cup of sugar every single day which adds up to 150-170 pounds a year! Wow. I have no doubt I was in that category before starting this, that is if you include fake sugars in that total. I’m not going to bore you today with meal pictures but I am going to share my weekly meal prep pictures. Like I mentioned yesterday, I don’t know if it’s laziness or smartness but I took a lot less time preparing my meals this week. I may end up paying for it by not having as flavorful of food that I have been but I just needed a little bit of a break. It still took 4-5 hours to cook everything so it’s not like it wasn’t still effort. Before we get into food I have to share my newest discovery with you. I say it’s new to me but it certainly isn’t new. All those women decades ago sure knew what they were doing when they wore aprons to cook. 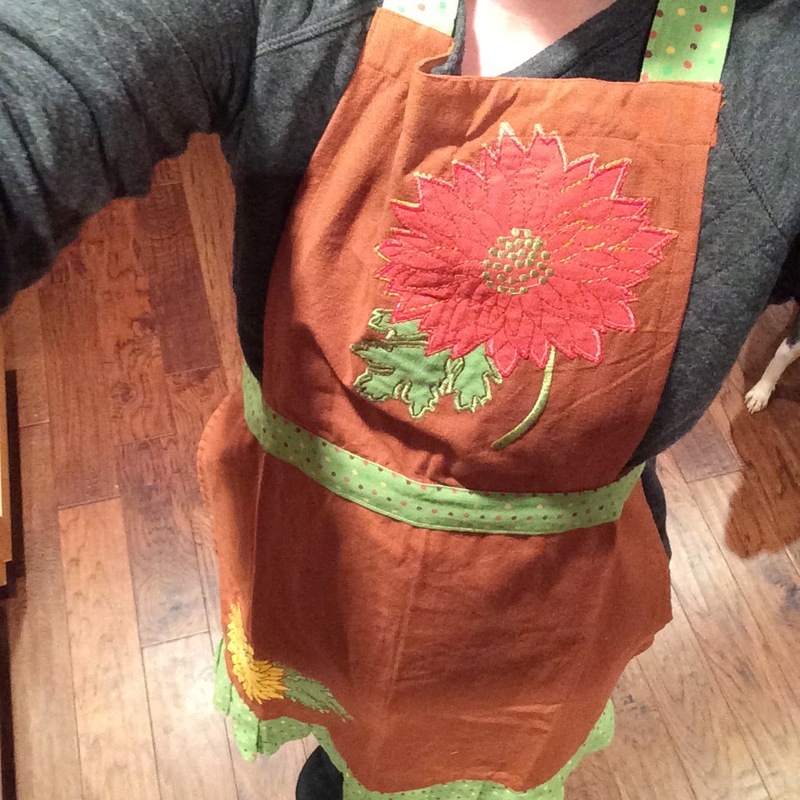 I bought myself an apron (mostly because I decided to cook beets and they will stain anything that even comes close to them). But, it was awesome. I didn’t get dirty or wet, and when I needed to dry my hands after washing them for the millionth time I had a towel right there. So easy. Look close, there’s an apron but no heels or cute skirt/dress. Give me a break, it was 1am, lol. Okay, here it is! Here’s what I’m going to be eating this week. 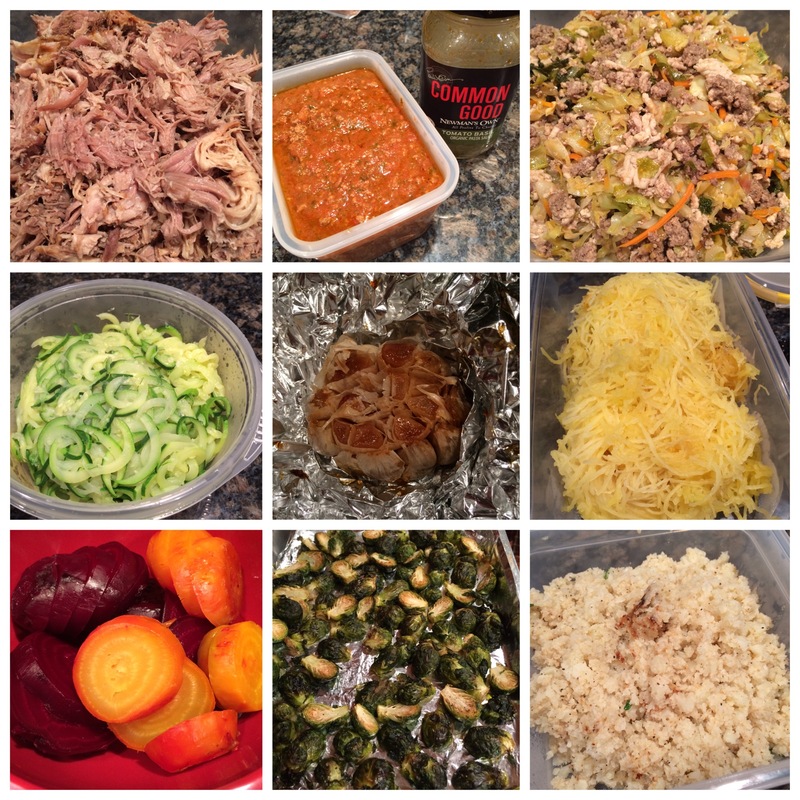 From left to right top to bottom: kalua pig, spaghetti sauce with ground beef (yes I found store bought that only had good and organic ingredients with no sugar added, it’s spendy but worth it), crack slaw (of course), zoodles (zucchini noodles), roasted garlic, spaghetti squash, both red and golden roasted beets (aren’t they gorgeous? ), roasted brussels sprouts, and cauliflower rice. I also made more mayo and ranch dressing but didn’t take photos since you already know what they look like. Oh, and do you know what this is? It’s fennel! 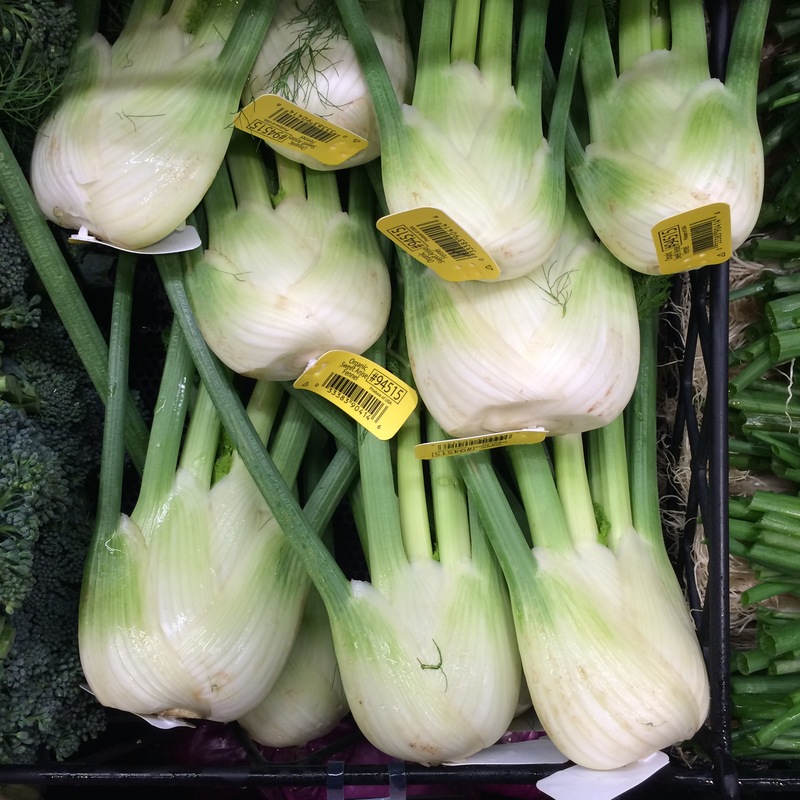 It’s one of my favorite vegetables but I never remember to buy it. I bought one just to eat raw. It’s so good! It tastes like black licorice so if you’re into that sort of thing you should really give this vegetable a shot. 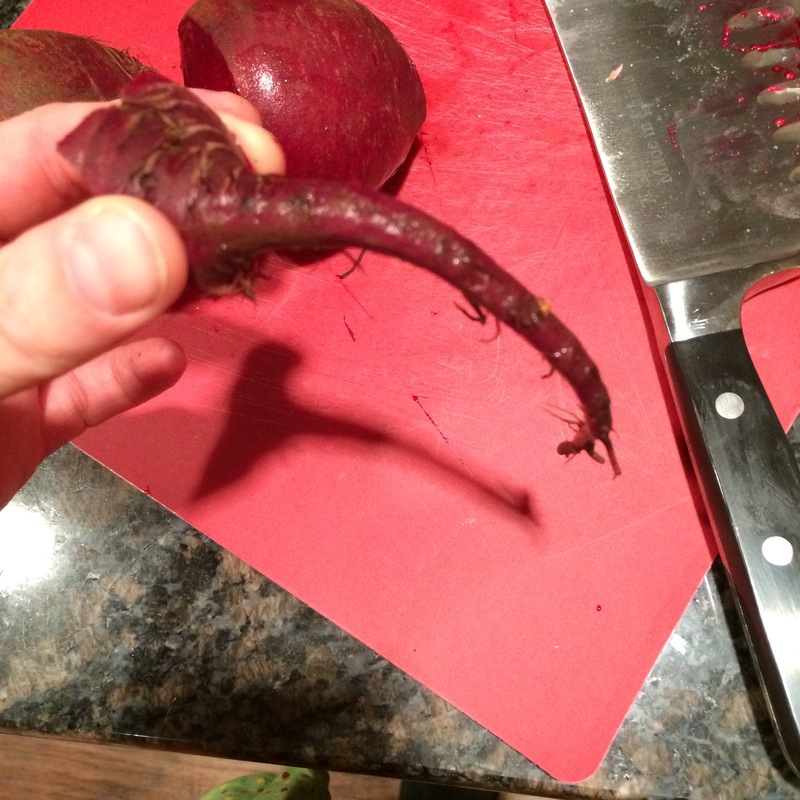 I must have halloween on my mind because when I was cutting the beets I noticed this…. You can’t tell me that doesn’t look like a rat tail, haha. No excuse not to eat the beets though. They are really good roasted. I still haven’t decided if they are worth the mess or not yet though. This week is going to be real interesting for me. I’ll be having approximately six consecutive meals away from home. I just hope I can find food that I’ll be able to eat and that I won’t be starving the entire time. Here’s to week three!